Welcome to Panniers and Granny Gears! Hello everyone! We are Danielle Cummings and Ted Olds, two folks who live in Brooklyn, NY and whose favorite mode of transportation is our bicycles. Danielle is graduating from a Masters in Public Administration program at NYU in May, and Ted is beginning law school in August. That leaves us with a 2+ month gap in real-life responsibility and perhaps our last opportunity to take our dream vacation: a coast-to-coast bike tour of North America. So we’re doing it! We’re really doing it. Why are we starting this blog? We figured people (read: our moms and dads and maybe our brothers and sisters) would want to hear about and see our progress (at least we hope so), so we figured a blog was an efficient way to share. Plus, it will be nice to have a record of this trip to share with our grandkids someday. 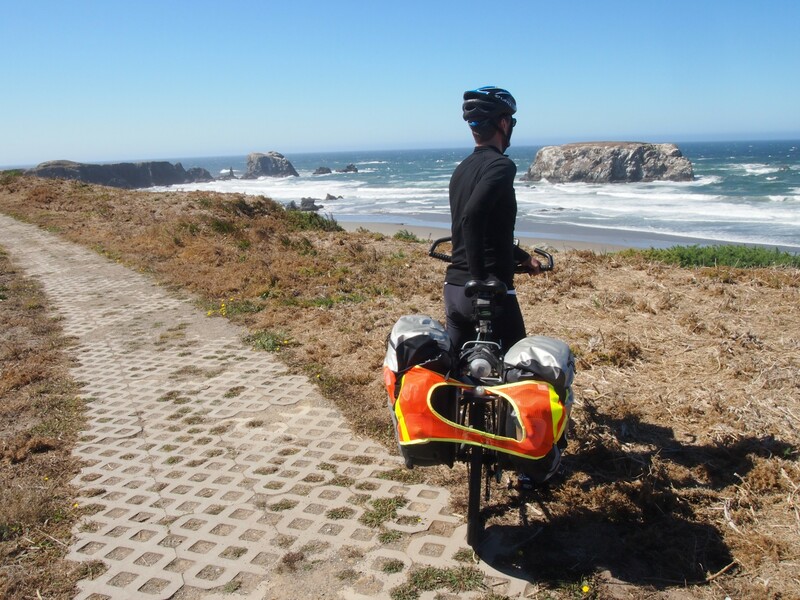 Our upcoming tour inspired this blog, but we’ll also review some of our past bike tours and we plan to add new trips as we travel in the future. Leaving Cape Lookout State Park at sunrise. Why are we riding our bikes across the country? 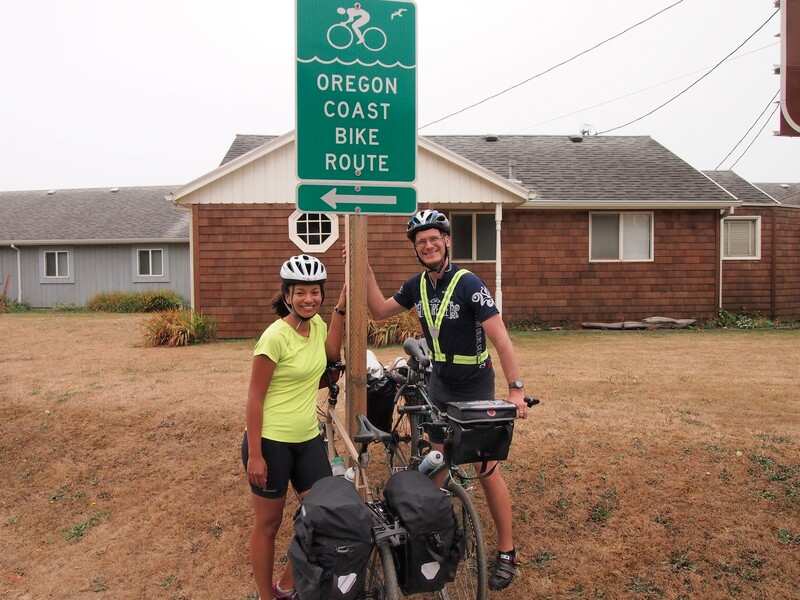 We fell in love with bike touring on our honeymoon in 2012 – a one-week bike trip down the Oregon coast. If it were up to us we would have kept cycling until we reached Patagonia, but work and dog beckoned, so we headed home and dreamt of our next big trip. We’ve only had a chance to take a few more (too-short, can barely call them) bike tours, so we’re thrilled to take two months to travel from Anacortes, WA to Brooklyn, NY. That’s right – we plan to ride to Coney Island and then roll up to our front door on the last day of the trip. 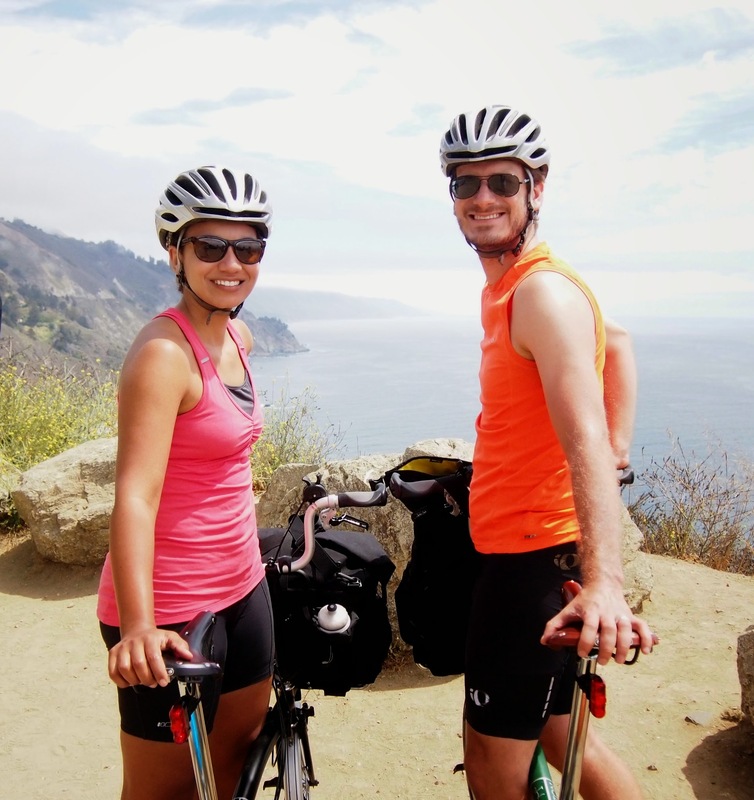 Dirty, sweaty, stinky honeymoon bike tour. 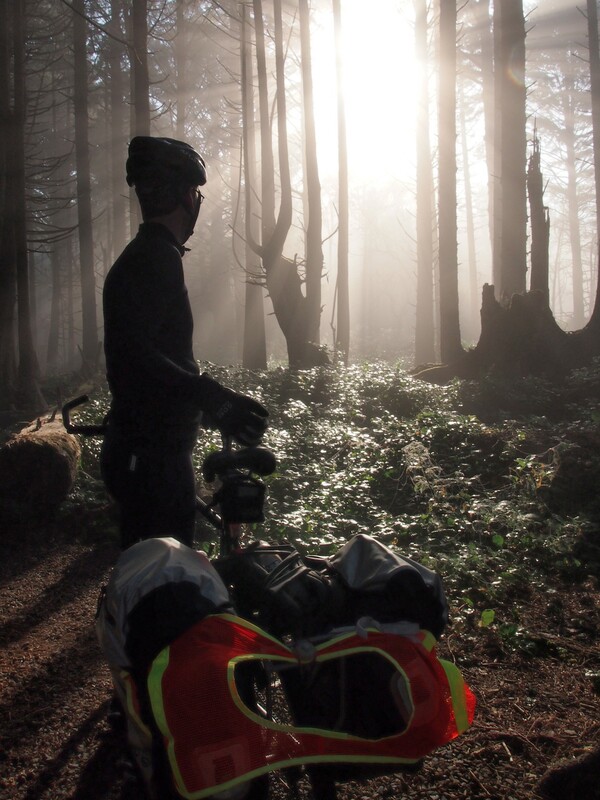 Why do we enjoy bike touring? 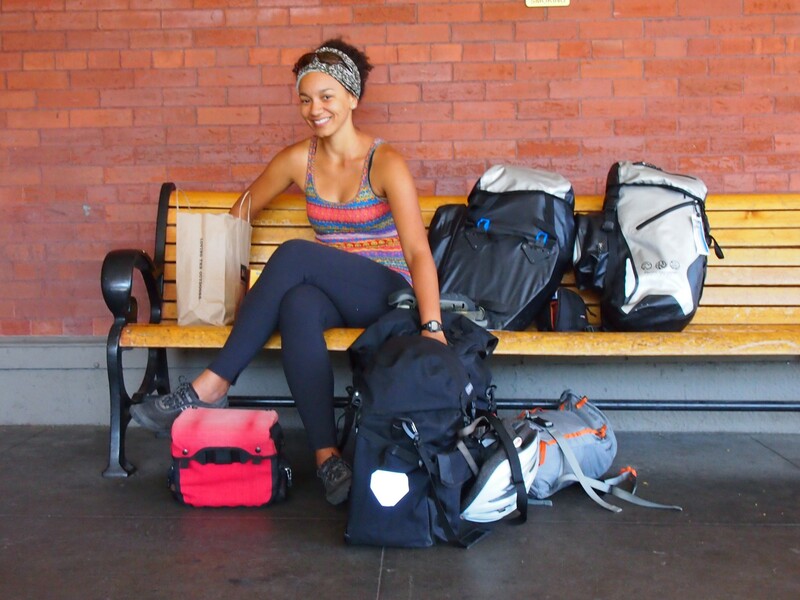 Danielle is ruthlessly efficient and nothing makes her happier than carrying everything she needs to live on her back or in panniers. Ted believes cycling is the perfect speed at which to travel – fast enough that you travel a decent distance in a day (as opposed to backpacking) and slow enough that you can take in the scenery (as opposed to car travel). Also, nothing can describe the joy of bike touring – it’s self-sufficiency; being slammed in the face with magnificent beauty; stretching your physical, mental, spiritual, and emotional self; and meeting incredible people along the way. It’s everything. Ted moving along the coast at the perfect pace.